It always happens. While basking in the joy of being illness free for a whole year, I get sick for the second time in 2 months. I guess it's Murphy's Law... It's like every time I wash my car, a big bird decides to defecate on it. Or how my preciously sought-after parking spot in Richmond is ripped away from me like the last pack of toilet paper on sale at Stupidstore... However, unlike last time (stomach flu), I am mobile. No need for facilities within 15 feet. All I have is this nasty cough. Maybe that'll get me somewhere in a lineup at Aberdeen Centre, they'll think I have H1N1. Quick! Where are the face masks??? Kidding aside, it really stinks to be sic k, especially when food needs to be eaten. Needing to take my son for a doctor's appointment in the Fleetwood area, I decided that we had to stop for food first (of course we do). For me, I needed something soupy for my cough and something that my son might eat. 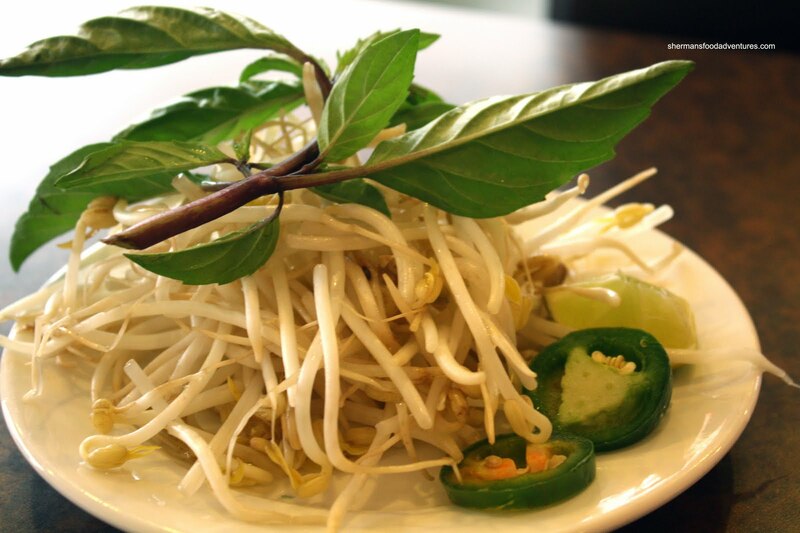 So I decided to stop for pho. The first place that caught my fancy was a small little Vietnamese restaurant on 152nd near Fraser Hwy. While entering the parking lot, I was tempted by the AYCE Japanese/Korean place (Il Uk Jo) on the corne r; but alas, with my son, it would be more like all-he-won't-eat. 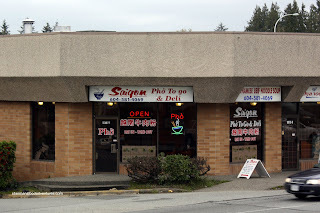 So off to Saigon Pho to Go next door. We were greeted by the very friendly owner and despite the restaurant being relatively empty, my son decides to pick the table in the corner with the worst lighting possible. Oh well... I went for a large order of their "everything" Pho and plus an order of the Grilled Pork Vermicelli Bowl with spring rolls for my son (yah, I know he won't eat half of the stuff, I ended up taking it home). 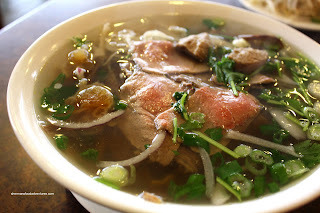 If you have a hard time making out the noodles in my pho, the reason for that is the enormous amount of tender meat. As for the noodles, they were a nice al dente texture. However, the broth itself was quite weak, bordering on bland. I could barely make out any distinctive flavours at all. 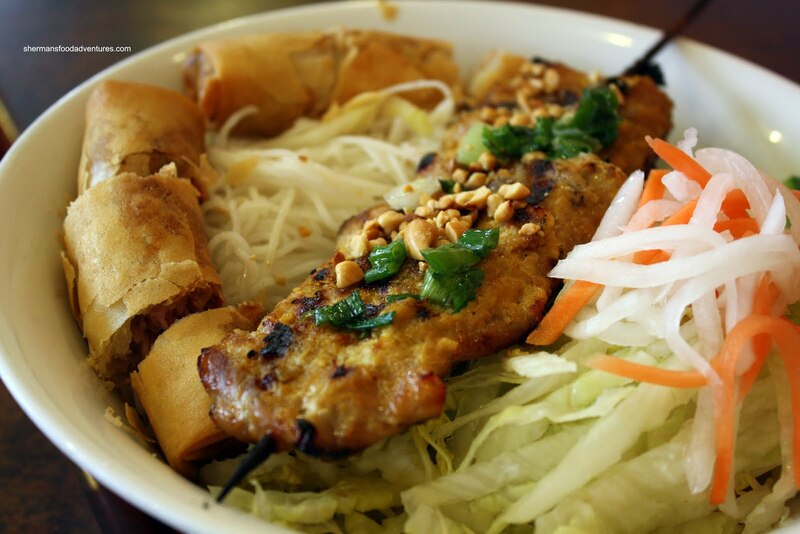 The Vermicelli Bowl was quite good. The pork skewer was cooked perfectly with a bit of charring. Plenty of flavours from the marinade. Although we both liked the spring rolls, I would've preferred the rice wrapper rather than the flour wrapper (to me, it's just more Vietnamese). For what it's worth, the food was pretty decent considering its location. Also the owner is quite a friendly guy. LOL Rosanna! I eat everywhere!